Hey Everyone! 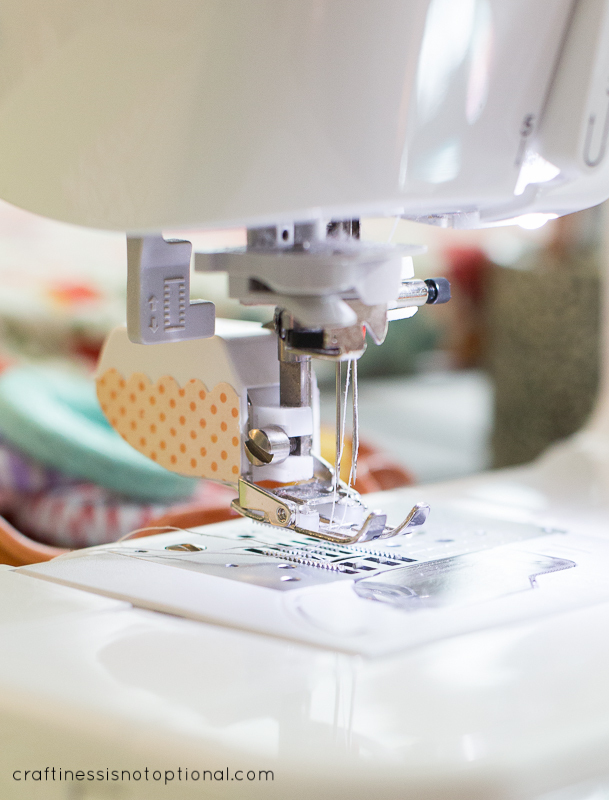 We are beyond thrilled to bring you this incredible tutorial in partnership with one of our very favorite blogs on the block: Craftiness Is Not Optional. Jess of Craftiness Is Not Optional is the sweetest gal, has the cutest daughters, and is seriously crafty. She used our first ever line of organic knits, Elk Grove Knits by Jay-Cyn Designs, to put together this very special tutorial just for you guys! We couldn’t be more thrilled to share it with you. Head over to Craftiness Is Not Optional and see soooooo much more where this came from. 🙂 And now I’ll pass the reins over to Jess! Take it away Jess! Hey guys! Jess here, from Craftiness is not Optional! 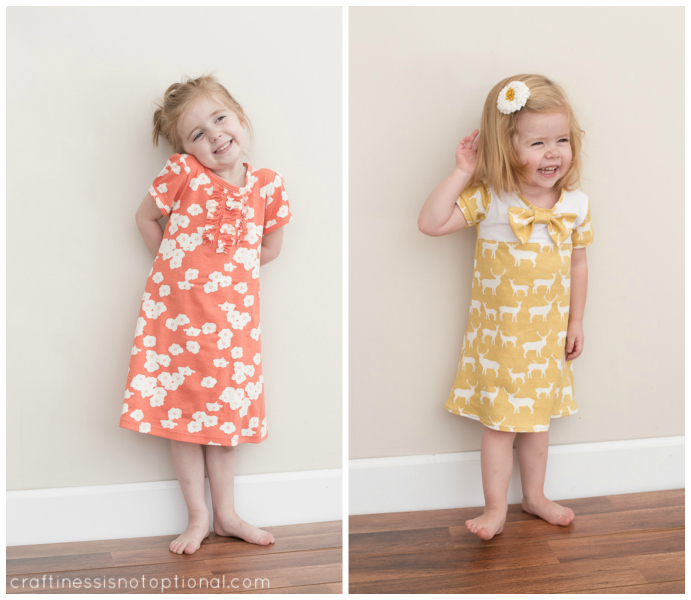 I am so excited to share a few tips on sewing with knits, plus tutorial for both these cute dresses, today! 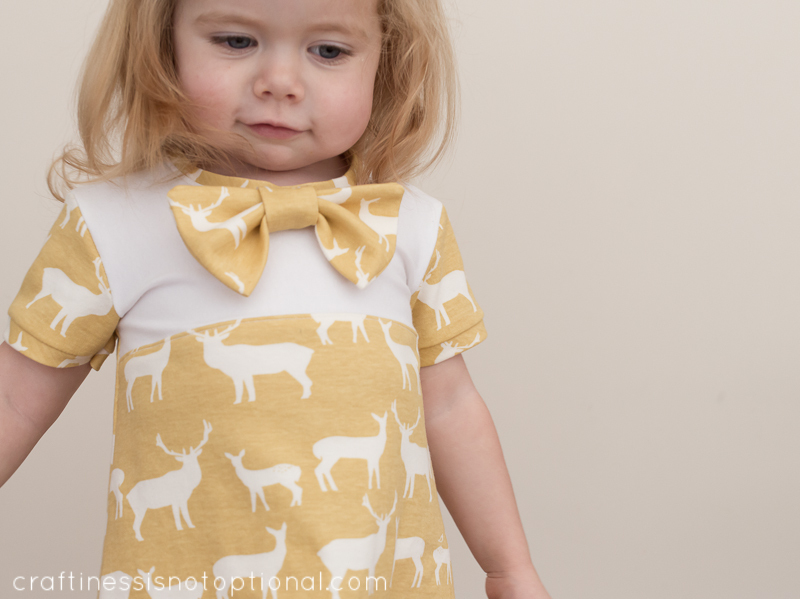 I absolutely love the new Birch Fabric organic knits, they are dreamy to sew with and so comfy. My girls adored the dresses I made for them. So soft and luscious! I had fun changing up a simple A-line dress in two different ways-I can’t even decide which is my favorite! Which is yours? 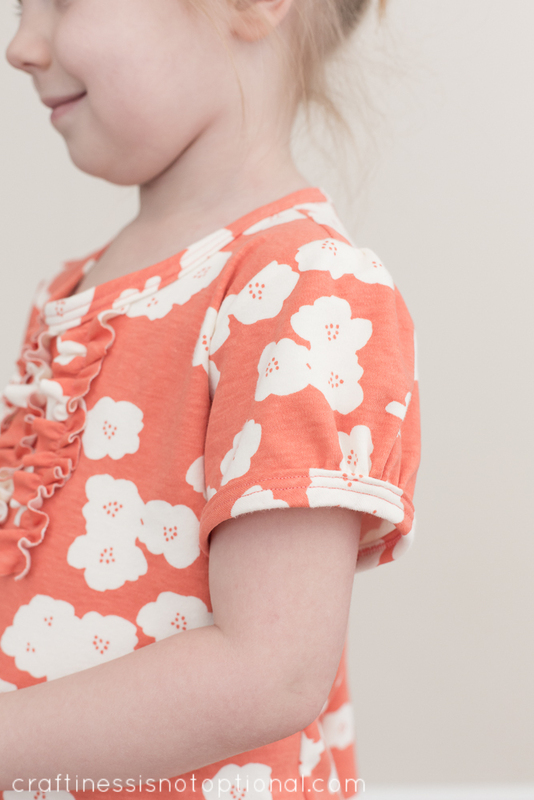 I used their gorgeous Poppies in Coral for this dress-which features some sweet ruffles on the front, gathered sleeves, and bias tape on the neckline and sleeves. 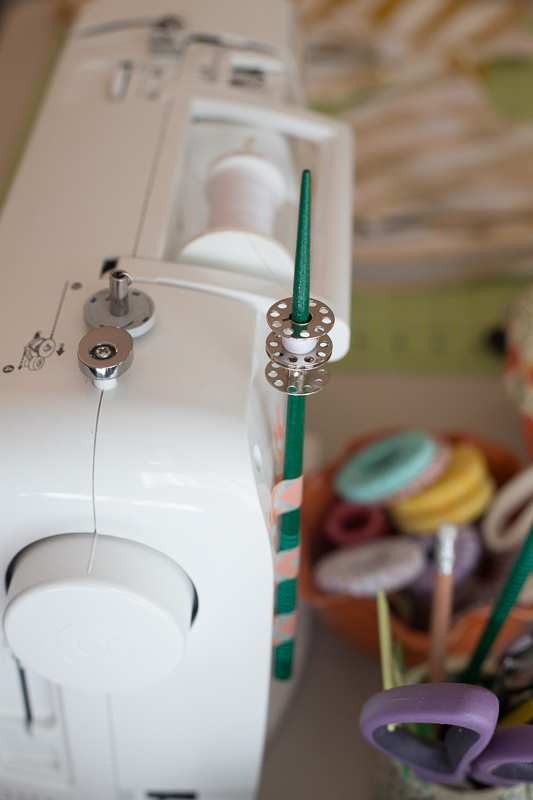 First, some tips for sewing with knits! tiny loops that make up the fabric. steam can “set” a slightly wonky seam and make it lay nicely. roll. Just spray and press with your iron to get it to lay flat! time, eliminating a lot of the “slippery” problems that knits can have. scraps to play around with the stitches and see which one you like best! stitching on the top, and a zig zag on the underneath. It’s awesome. I’ll show you how I set up to thread below! was getting a little stuck. MacGyver would be proud, right? the threads and put them through each needle so they don’t get tangled. 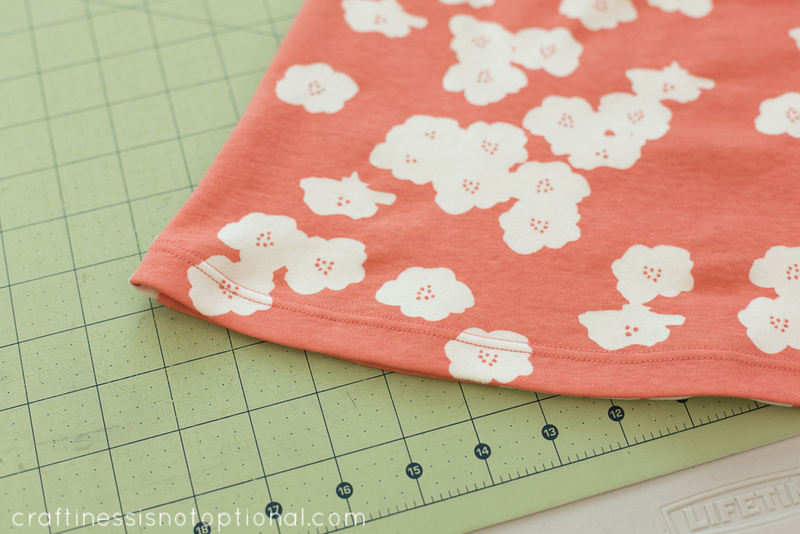 To make the pattern, fold a tee in half and trace around it, don’t forget to add seam allowances! 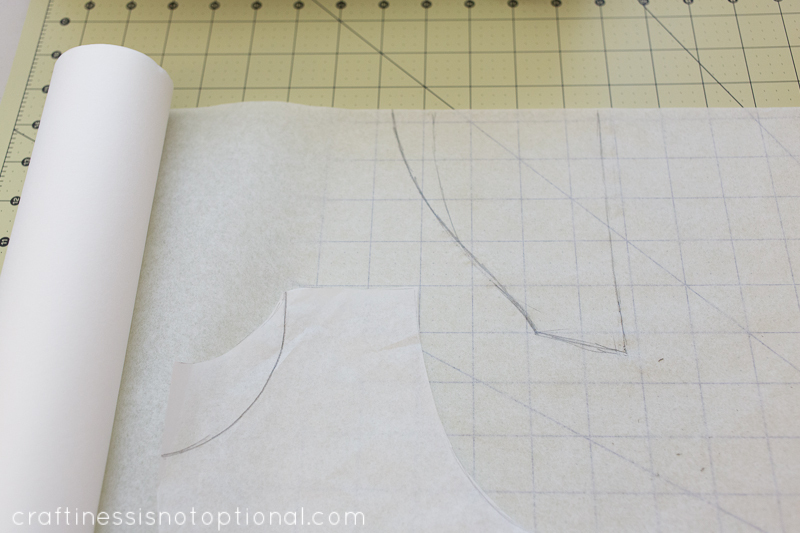 Then continue the side of the dress down to create an A-line shape. You can use a similar style to help you with the shape and length, but since it’s knit, it’s pretty forgiving! 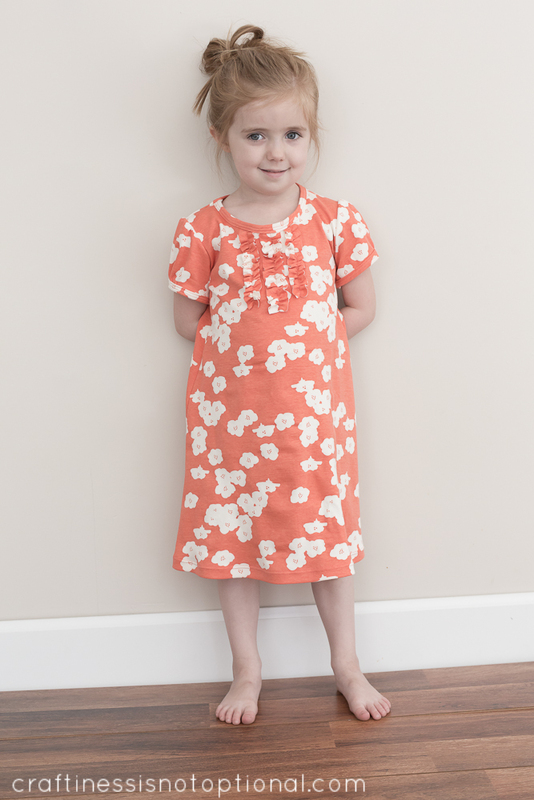 Here’s a look at my simple A-line dress pattern-easy peasy! Label the fold and size. 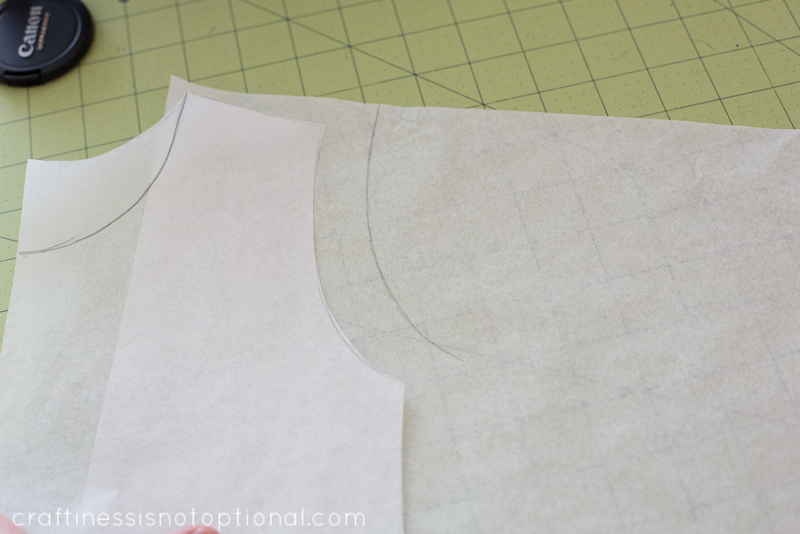 and draw out a sleeve shape like this one..
Then extend the curve up a little like so. It may take some playing around to get the right shape, or a feel for creating sleeve patterns, but this one is a forgiving sleeve, since it’s gathered. 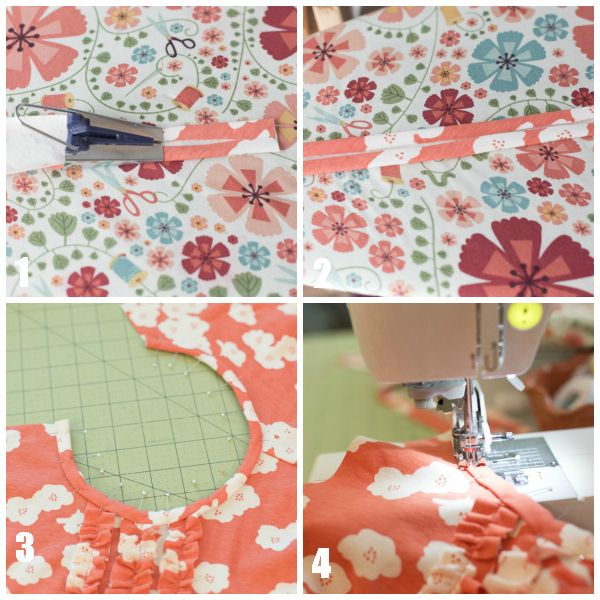 Then cut out a front and back piece, two sleeves, and strips of fabric-for the collar and sleeve bands, I cut them on the bias-and 1.75″ wide, and for the ruffles, 1″ for the middle ruffle, then 3/4″ for the outside ruffles. 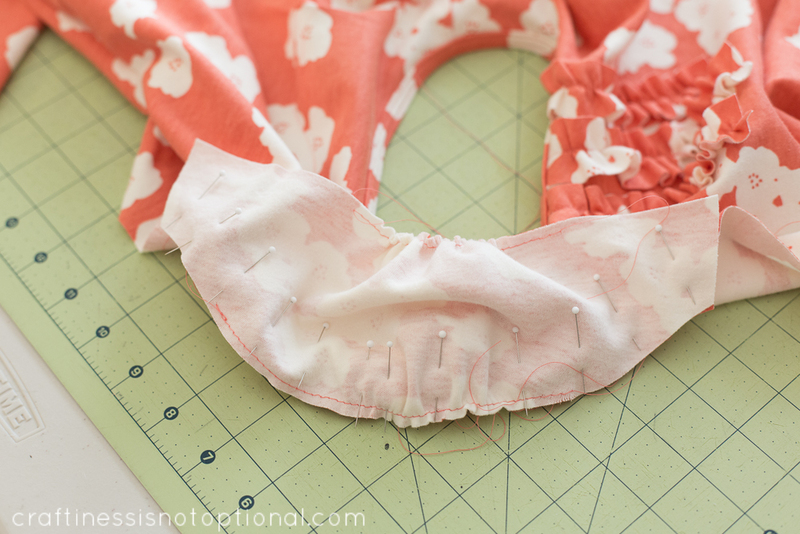 For the ruffle strips, cut them twice as long as you want them to go down the front of the dress. 1. 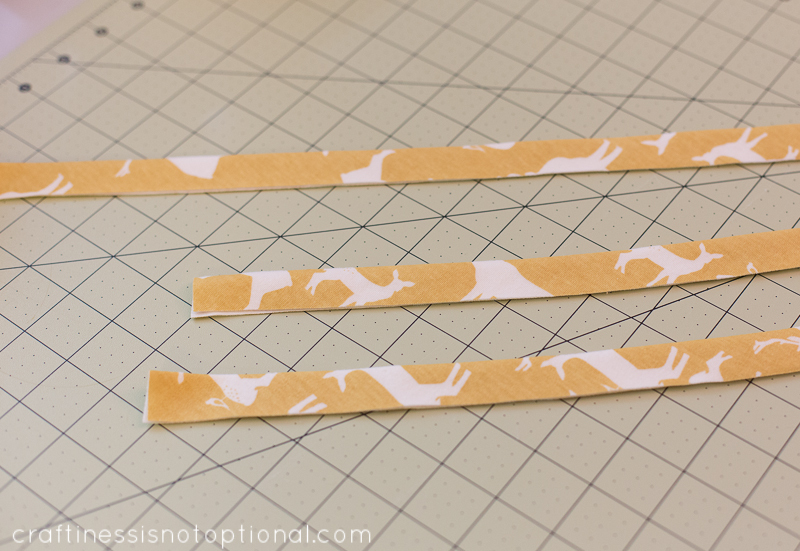 Next set your straight stitch to a long stitch and sew down the middle of a strip, then pull the thread to gather. 2. 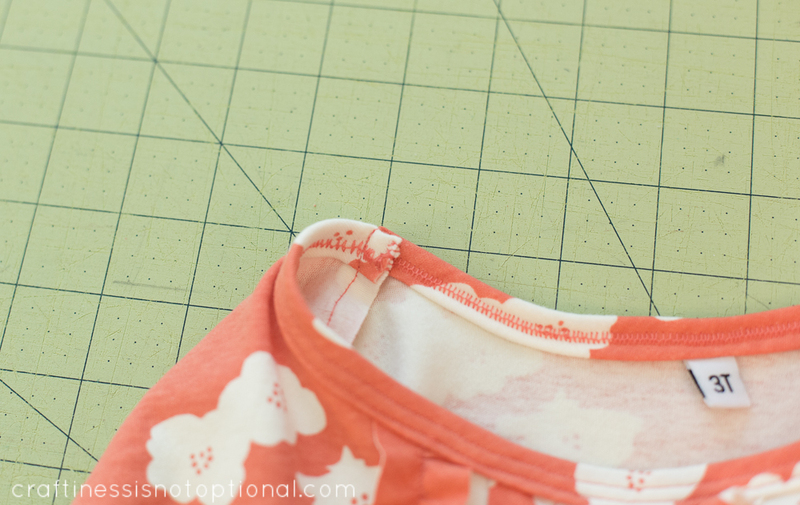 Fold the front dress piece in half and mark with a fabric pen or press with the iron. 3. Then match up the center of the ruffle with the center of the dress, and pin in place. 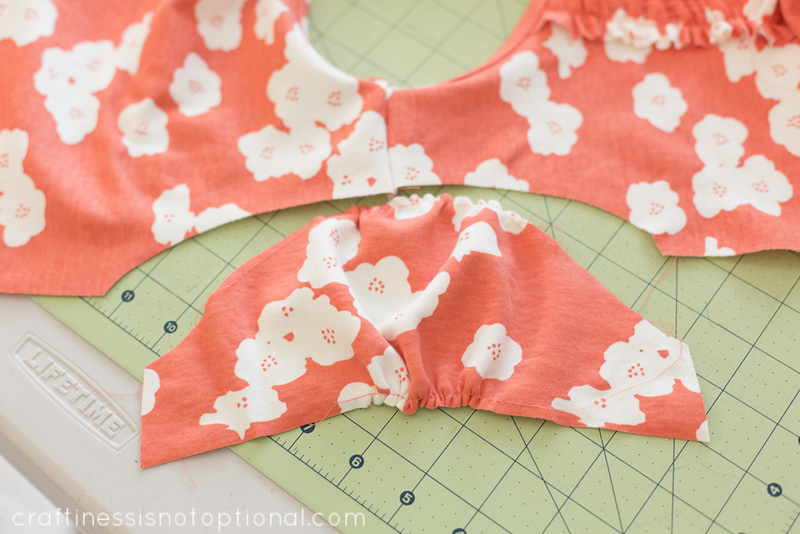 Make sure the top of the ruffle lies flat where it will be covered with the bias tape. 4. 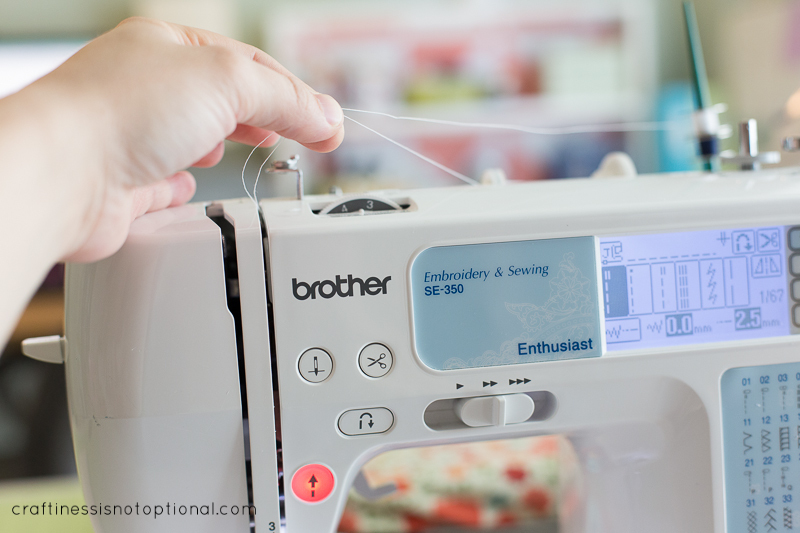 Sew down the middle with a regular straight stitch, then remove the gathering stitches with a seam ripper. Repeat with the other two ruffles, placing them an equal distance from the middle ruffle. 1. 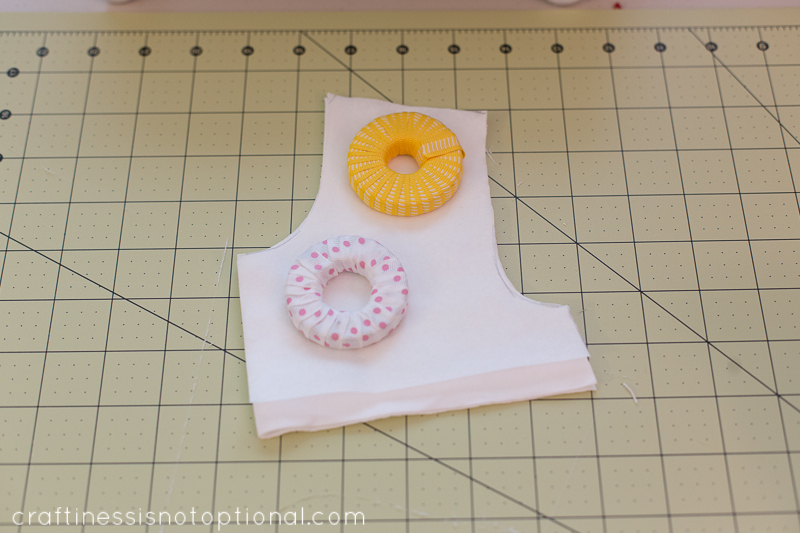 Now make some bias tape for the neckline and sleeves…I like using my little gadget but you can also just fold in the long edges to the center and press with your iron, then in half again…I usually cut mine 1.75″ wide. 2. (not shown) Next, pin and sew one of the shoulder seams right sides together. 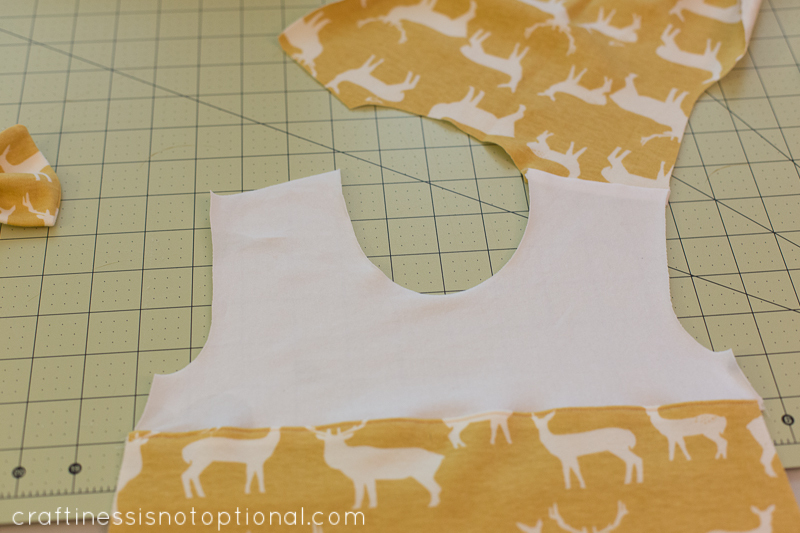 3.Then pin the bias tape in place around the neckline like so. 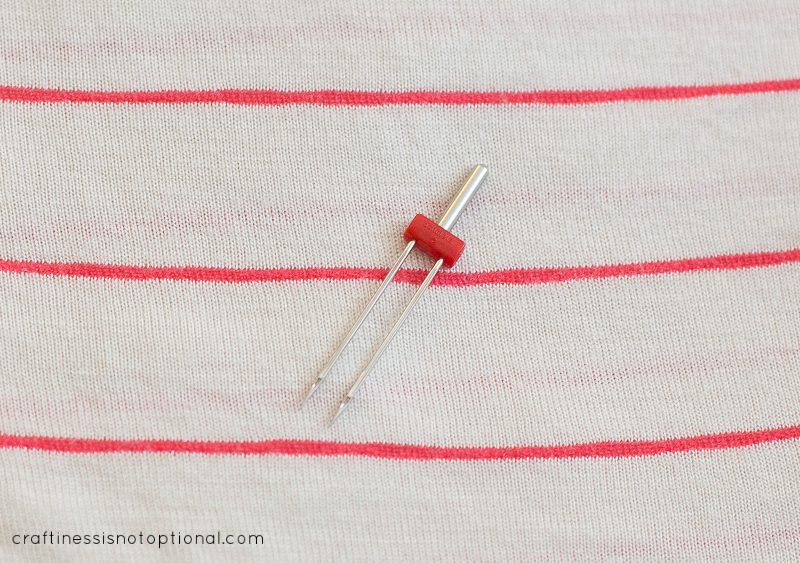 4.Then with a double needle, sew carefully around the neckline. 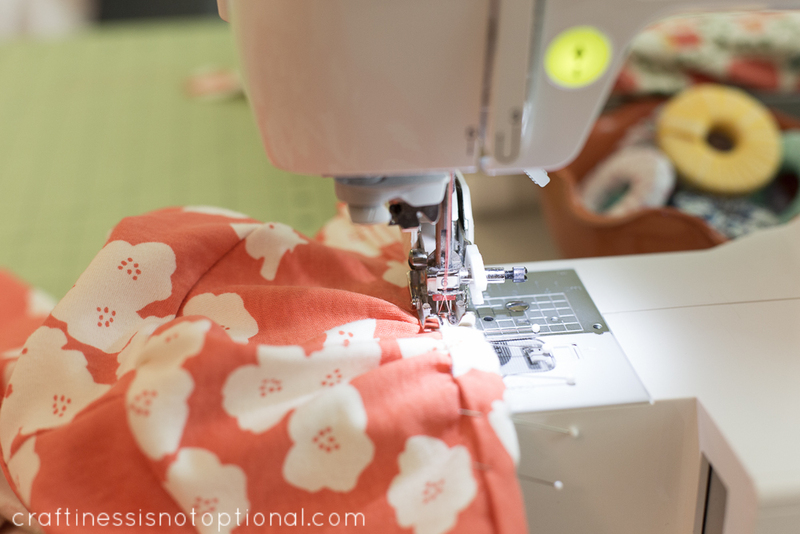 Switch back to a regular needle, and sew the other shoulder seam, right sides together. Then hand sew the seam allowance to the back so that it lays flat. 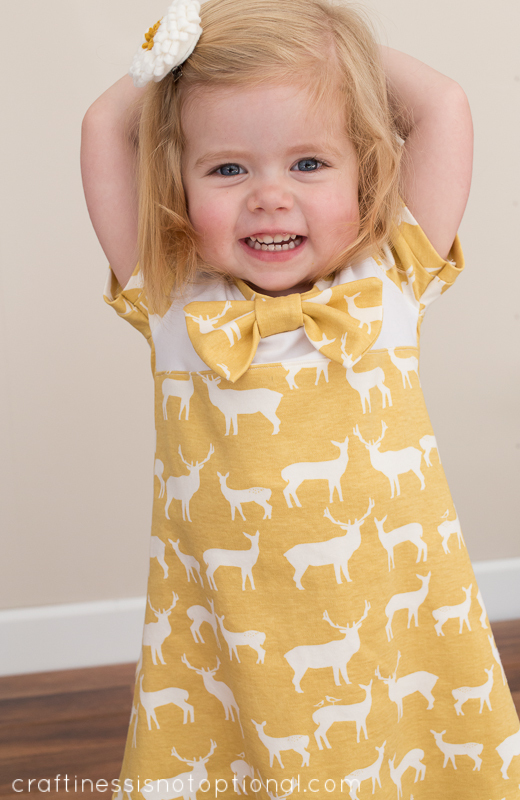 Next sew a long, gathering stitch along the top and bottom of the sleeves and gather the bottom to fit the measurement of your child’s arm, plus 1.5″ of seam allowance and wearing ease. Then gather the top to fit the armhole like so. Pin in place, right sides together, then sew in place. Repeat for other sleeve. Then pin the sides together, lining up the seams, and sew. Slowly!-over the bias tape sleeve band. 3….and sew back up about an inch…tada! No messy back stitching or bunching up. But if you don’t want to leave the bottom raw, fold up and iron about an inch and sew with a double needle. 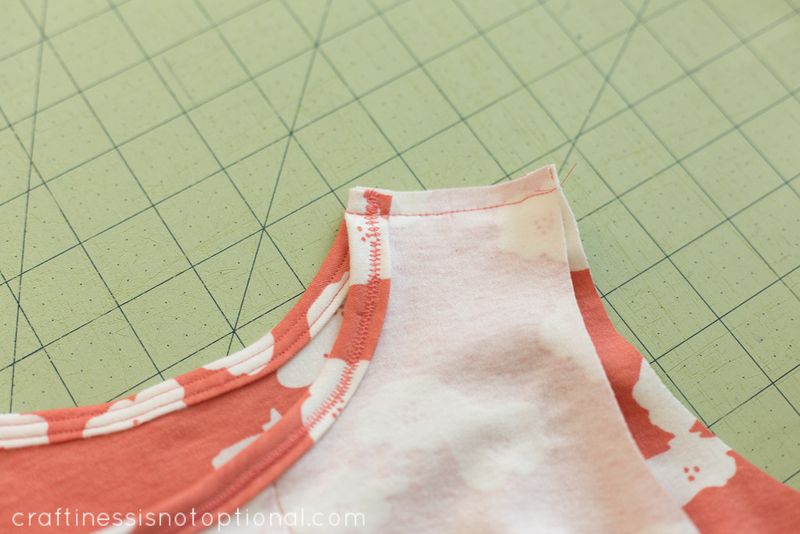 Trim any extra fabric on the back side carefully and you’re done! 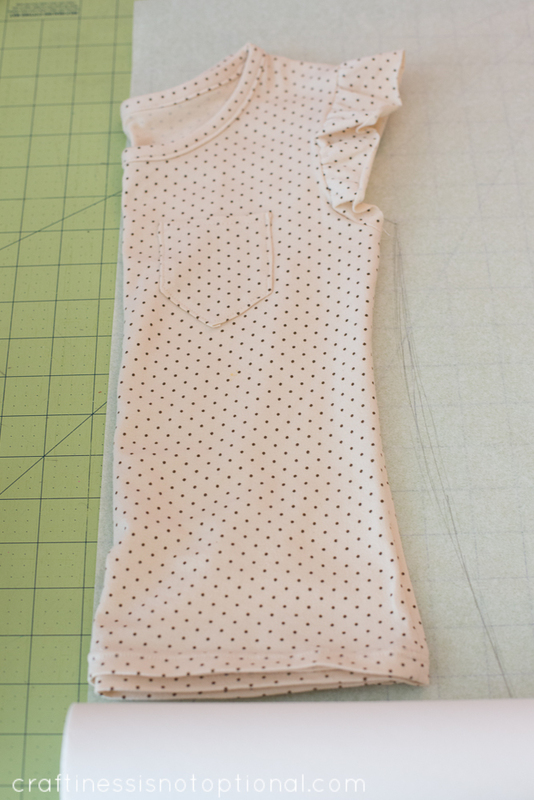 Next I cut out the bottom portion of my main fabric, adding seam allowance to the top. 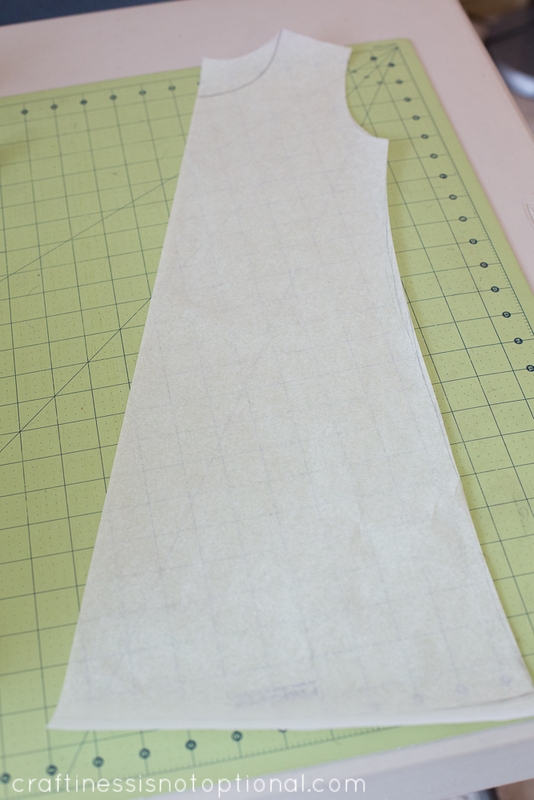 Then the top part of the dress (in white fabric), also on the fold, also with seam allowance added on the bottom! 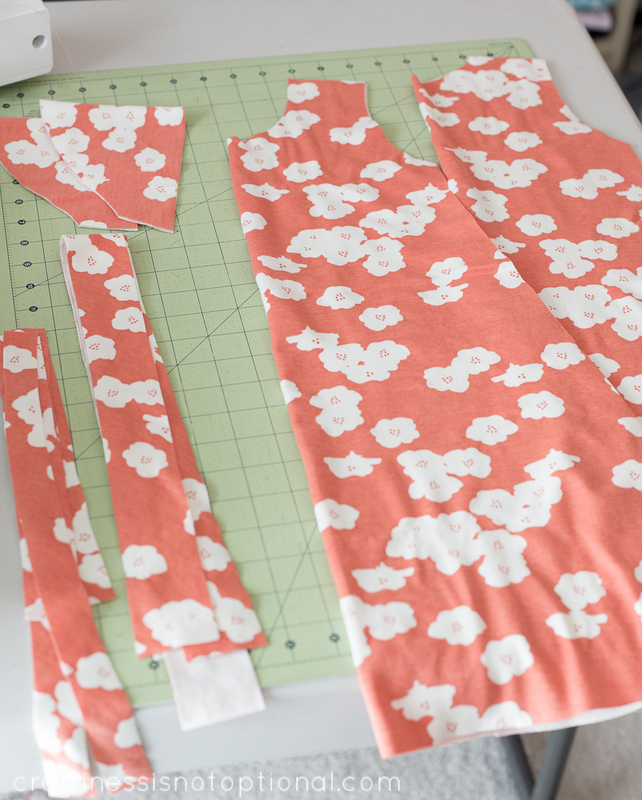 I also made a sleeve pattern like the coral dress, and cut out two of those on the fold. Then press the seam to the bottom and top stitch with a straight stitch. It helps if you steam it afterwards with the iron, too. Gets rid of wonkiness! Next sew one of the shoulder seams right sides together like so. 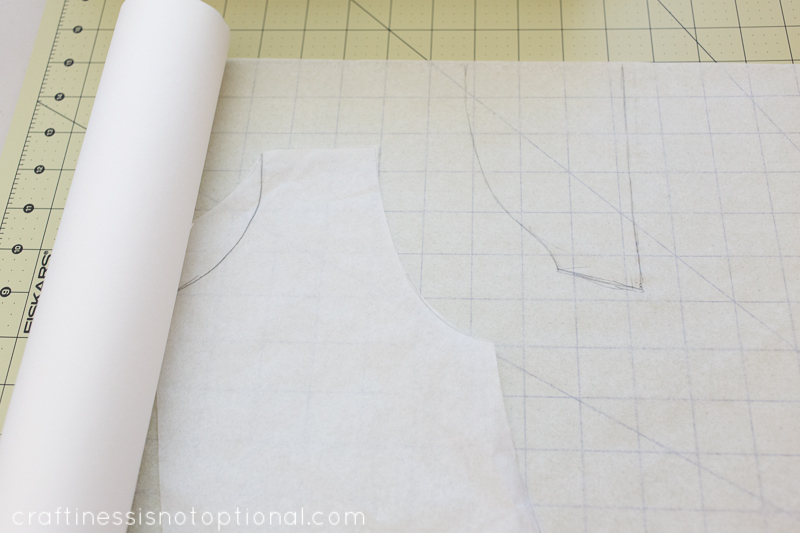 Cut some pieces of fabric the width you’d like for the neckline. 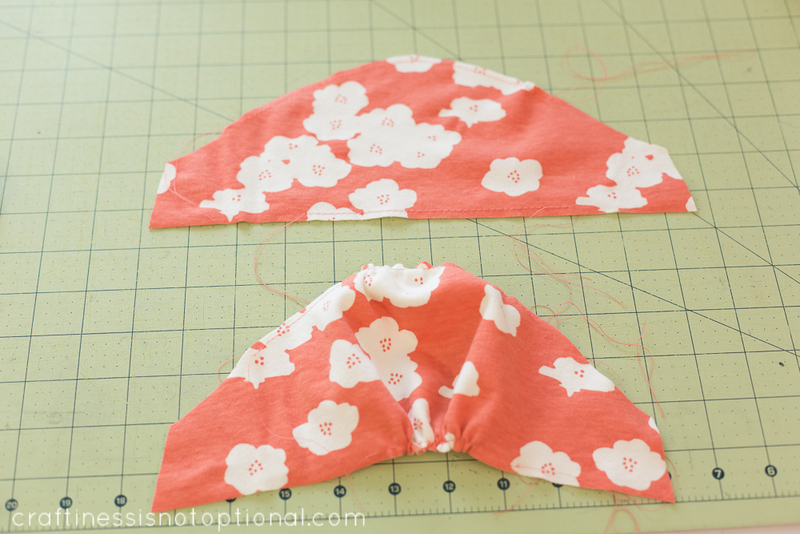 I cut mine 1″ wide and then folded it in half and ironed. 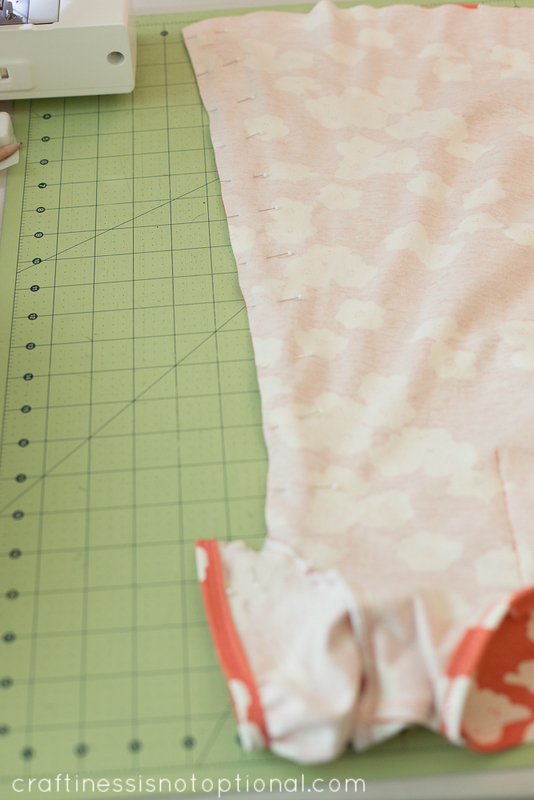 Make sure the stretch of the fabric is going lengthwise. Next match up the raw edges of the binding to the neckline and start sewing it on, I used the lightning bolt stitch again and a 1/4″ seam allowance here. Be sure to gently stretch the binding (not the dress!) while you sew. Then I made a simple bow to pin to the front! 1. Cut a rectangle of fabric. The size depends on your preference, but mine was 5.5″x6.5″. I folded it in half width-wise, then sewed all the way around the three open edges. Clip corners. 2. 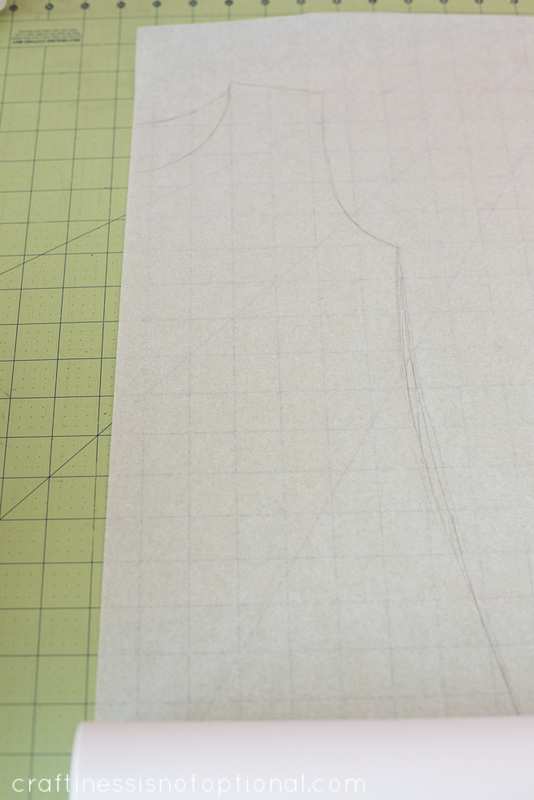 Then cut a small slit in the middle of one side of the sewn piece like so. Make sure the slit is angled the way that your bow center will be. 3. Turn right side out through the slit and press. 4. 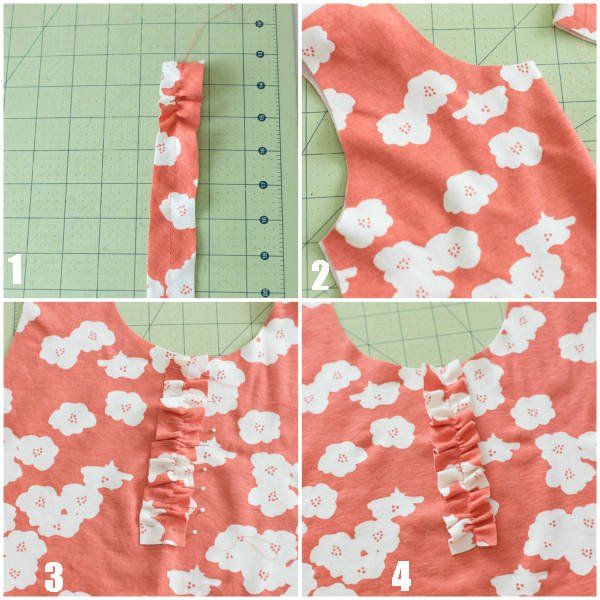 Gather the bow up and using a hand needle, sew a few stitches to keep it in place. 5. 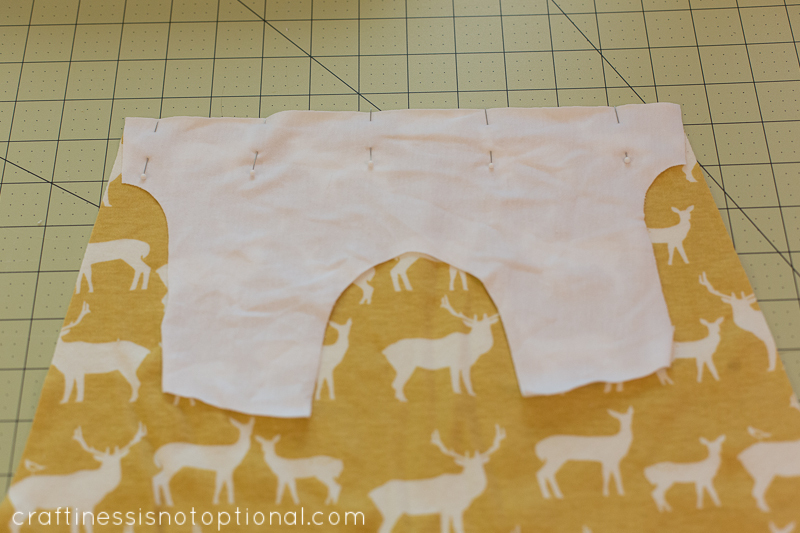 Oh, and cut a strip of fabric to be your bow center, then fold in half lengthwise and stitch. Turn right side out and press. 7. Wrap the bow center around the bow, then trim off extra. 8. Then fold under the raw edge and sew into place. I attached mine with a safety pin for washing purposes, but you could also hand sew it right onto the dress! 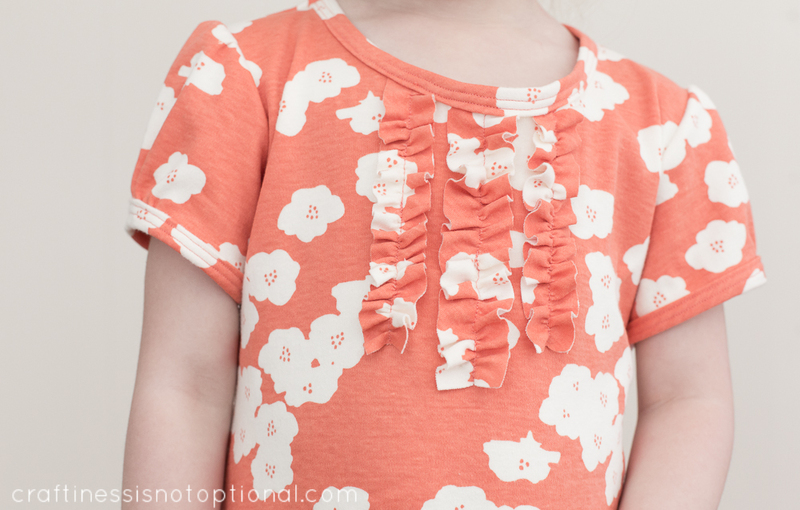 Hope you enjoyed seeing a few fun ways to embellish an easy A-line dress! 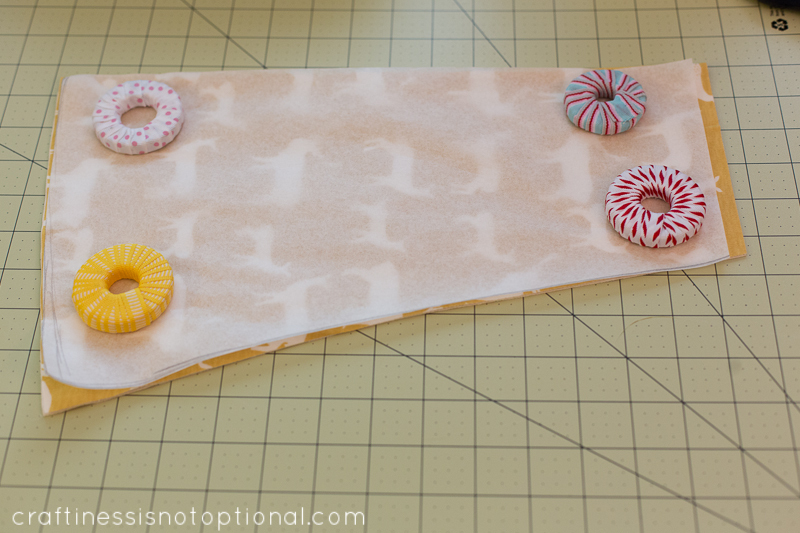 Come see more tutorials and projects over on Craftiness is not Optional! Thank you for sharing with us Jess! 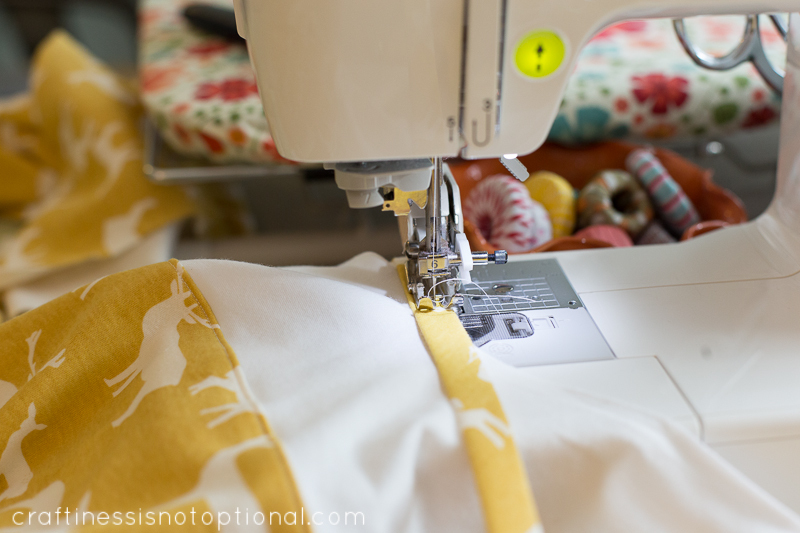 Make sure to check out Craftiness Is Not Optional for lots of cute projects and inspiration! Gorgeous! I never thought I would have the courage to sew with knits but that fabric is so lovely and you somehow managed to make it seem – well, not easy, but possible… Thanks! Very nice and your girls are so cute. I noticed your pattern weights and was wondering what you made those with? Beautiful! What a lot of good information in one tutorial! 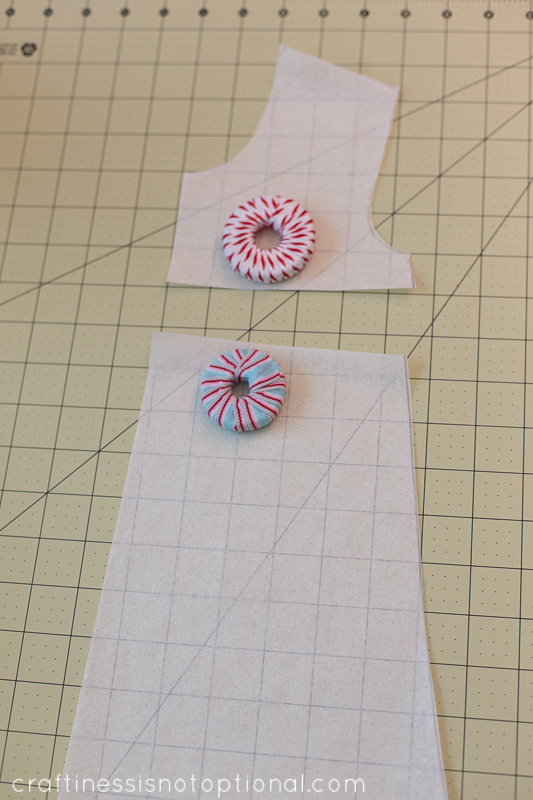 Making a pattern from a tee, handmade bias tape, using a double needle…you GO, girl! Thanks so much! Wow, great work! Beautiful dresses. Thanks for the free pattern and the easily to interpret instructions complete with lots of photos. What is with the 'doughnuts' though? Thanks for the super easy tutorial! I made the ruffle dress from some cute knit I got for $1.99/yd at SAS in Phoenix. The only part I had trouble with was that my serger choked on the bias tape, when I tried to surge the inside up through the sleeves. Not sure if my blade needs changing or if it's just too much fabric to expect a serger to handle. 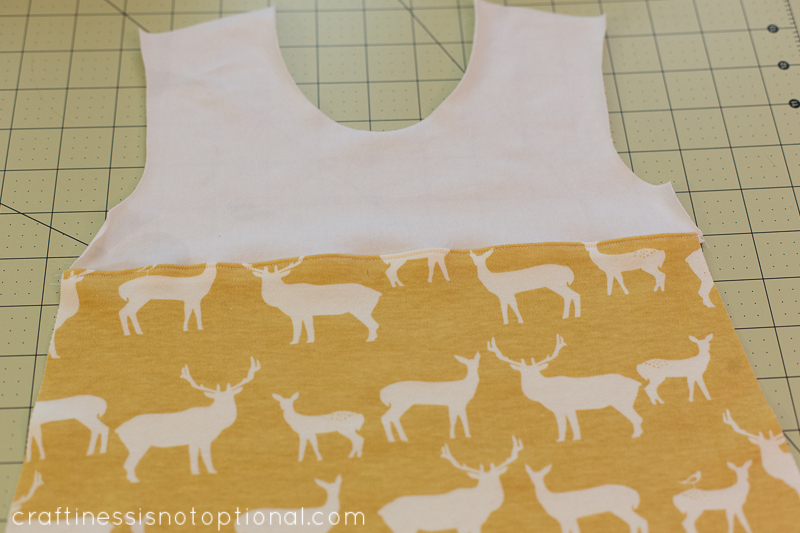 I'm still new to sewing/serging, so this was a great project and I learned a lot. Plus my daughter got a super cute wash n wear dress out of it! I know this is late in coming, but from looking at the pattern weights, I am guessing that she stacked a couple of large metal washers (Home Depot has lots of sizes) and wrapped them with binding tape or fabric selvages. I might try this myself! 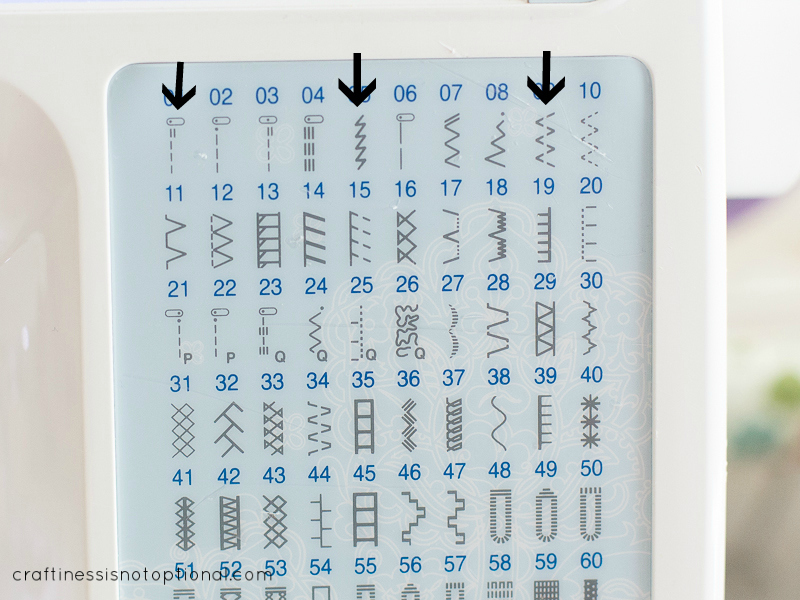 Just my two cents – They're pattern weights which are used instead of pins. 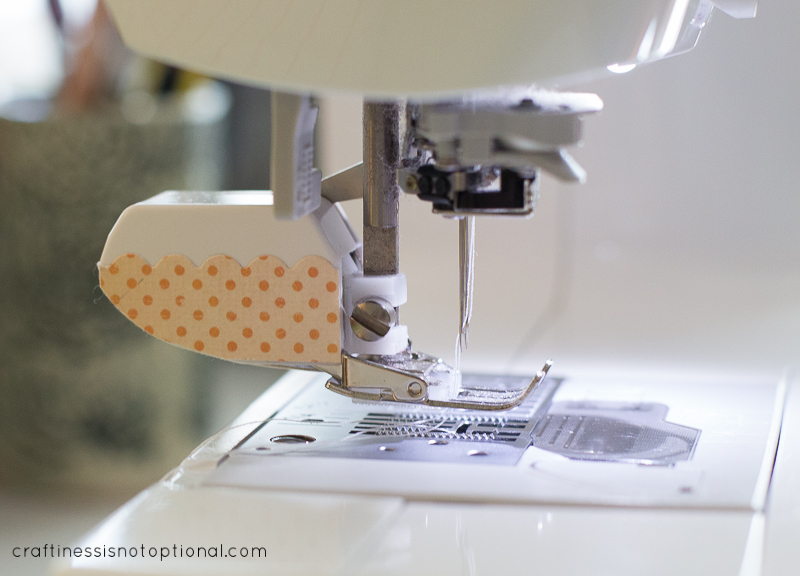 Keeps fabric and pattern from shifting while you cut. From looking at them, I am guessing that she stacked a couple of large metal washers (Home Depot has lots of sizes) and wrapped them with binding tape or fabric selvages. Great idea! Thank you so much for sharing your wonderful and very clear instructions and dress patterns. I truly appreciate it and GOD bless your kind heart for it. 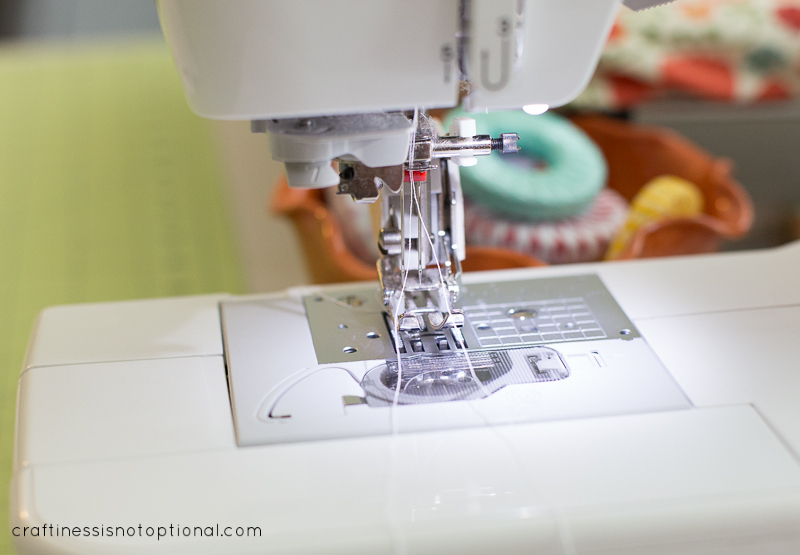 It is bloggers like you who are constantly motivating to do better in my sewing. I am new to blogging and sewing and have learned a lot from you. Book Your Quilt Market Appointment with Birch Fabrics!